How do group settings work on a Course? The general settings provide the member with the most commonly used settings on a group. The timezone field is very useful if you're facilitating participants who are in a different time zone to you. You can set up a group specifically for the participants in that timezone and set it to where they're based. This will ensure that the course start and end dates match their time zone. The course start date allows you to set the date and time of when you want to allow participants to start. Participants will not be able to start the course until the date arrives. The course end date allows you to set a date that your participants must complete the course by. 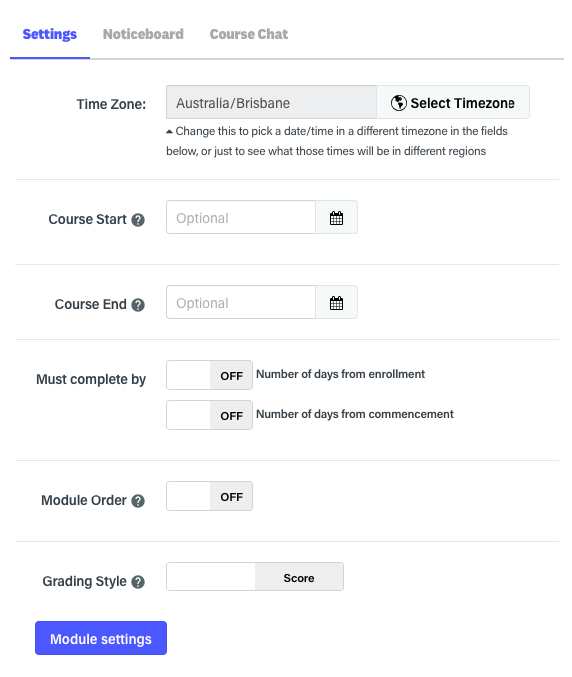 If you switch this setting on, you'll be able to set the number of days the Participant must complete the course by from the date of enrolment and also the number of days they have to complete the course once they have started. This setting forces participants to complete the modules in the order that you choose. For example, they will not be able to start a quiz until they've completed the preceding lesson. Tip: If Module Order is set to ON, you enable the ability to Hide Unavailable Modules. By toggling this to ON, all modules will be hidden except the next one available. Choose between Score or Competency grading styles. This will either provide scores to assessment items for participants, or mark as competent or not-yet-competent. To access these advanced module settings, simply click on the 'Module settings' button and this will open a new pop-up window. To edit these settings, click the yellow edit to reveal the associated module settings. Click the save button once you're done. This section allows you to change the settings for individual modules. For example, you may want to hide a quiz until a certain date, but display a lesson right away. You can also completely hide a module if you don't want the participants in the current group to see a particular module. Selecting this option allows hides the module from your participants. It will not be visible until you unhide it. Please note that this is not related to the start and end dates that you set. You can set specific dates for individual modules to be available to your participants. If a participant tries to view the module outside of these dates, they will be denied access. Due and Cutoff dates are only available for Assignments. Setting these here, will override the modules due and cutoff dates for this particular group. This section allows you to select what modules in the course are required for completion. 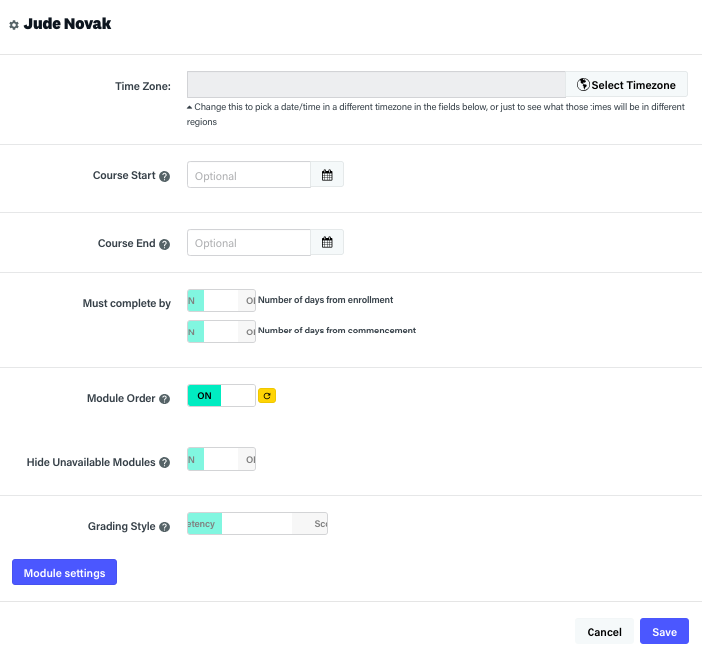 By default, all modules are required to complete a course, so if you have some additional reading that isn't required for completion, just toggle the requirement to NO. Once a participant completes all of the 'required' modules, Coassemble will mark the participant as complete and this will be indicated in the course reports. If you'd like to change any of these settings specifically for 1 participant, you can do that by clicking on the little calendar icon next to each participant. This brings up a new modal window where you can change the existing settings. Simply toggle ON/OFF any setting you like. To revert any setting you've changed, just click on the little yellow reverse icon.